Center Bout: 14 1/4" String Length: 41 1/2"
Rib Depth: *7 5/8" (Upper Bout at the Bend tapers from 7 1/2" to 5 3/8" at the Neck), *excluding Top & Back plates. Features: This is a super comfortable Bass to play with Shoulders of a Solo Bass but the volume of a larger Orchestra Bass. Originally it had nearly a 43" string length which was typical for the period, but with a Neck Graft, and the Block area slightly 'cut', we were able to reduce it down to 41 1/2". 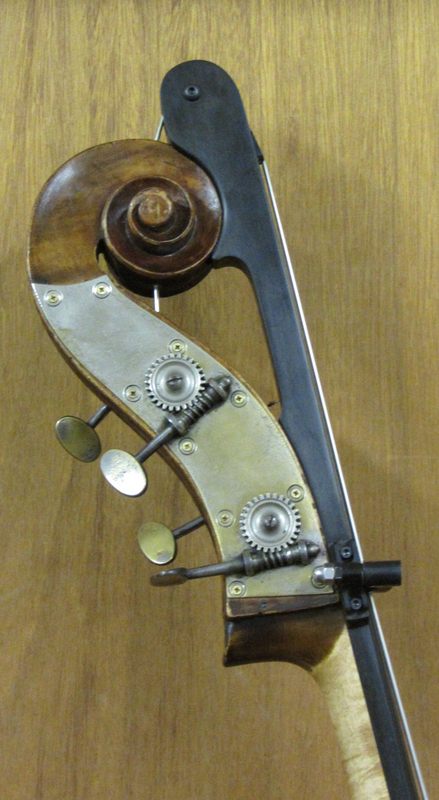 This well restored Bass is now ready for any type of playing including Solo, Orchestra or even Jazz. Note: When this Bass went into restoration Mike noticed some Pencil writing on the underside of the Tailpiece, V.Venegas - Uebel. 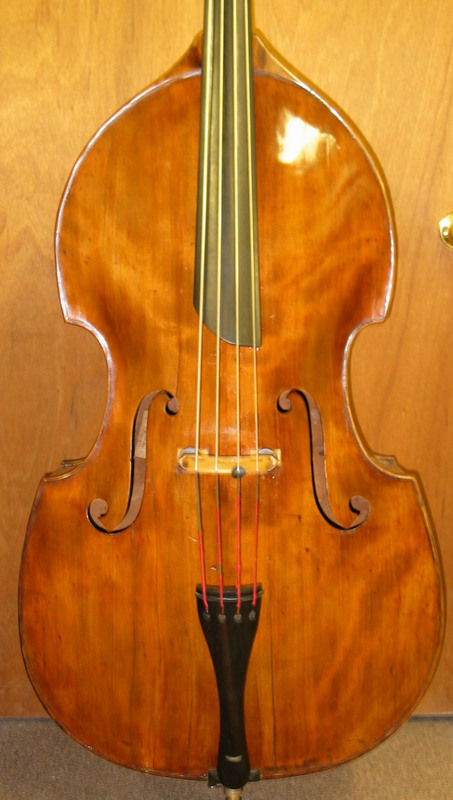 A few months ago while this Bass was still in restoration another identical looking Bass came up on line for evaluation and ID with a Label of Wilhelm Uebel, Markneukirchen, etc. I looked him up and found him listed as a 19th century maker starting his shop in 1868. Also, Mike remembered seeing this Bass some decades ago when he worked in the Kolstein shop and it belonged to bassist Victor Venegas who was an old friend of mine as well. 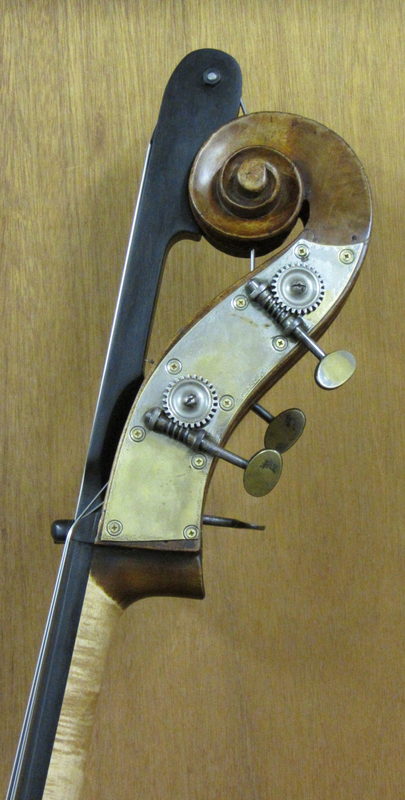 This Bass from his recollection was his main workhorse as his other two basses, a valuable Italian Bass and a large German Bass from K.Herrmann (Morelli brand import) were not as suitable for travel for one reason or another. About a decade ago this Bass was sold and appraised as a French Mirecourt Bass from 1860. Seeing the outer Linings clearly told me this was a German Bass. With the shape and arched roundback, this is a true quality instrument of its time. Being a responsible dealer/collector I must go with my experience from seeing another identical bass with a Label from this maker. Prior to seeing the name on the Tailpiece I still had it pegged as German and not French. 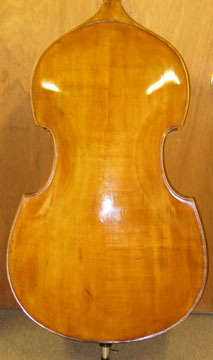 I have seen a few other Basses from various German makers with the same Purfling outline and most times, the Dealers call it French. This seems to be a common ID error for one reason or another. This Bass has a beautiful and very comfortable outline which is joy to play. 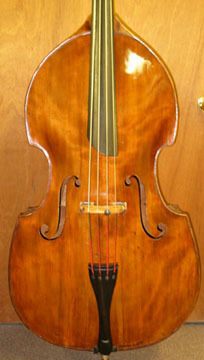 The Purfling running around the Top and Back plates often confuses Dealers and Players with French Basses of similar outlines as well as the larger Violin-Cello models made famous by the Parisian maker J.B. Vuillaume, his associates and followers from about the early-mid 19th century. With the outer Linings/Moldings as well as the upper cross Lining/Molding pieces mitered between the Top and Back plates clearly spells out quality old German work. 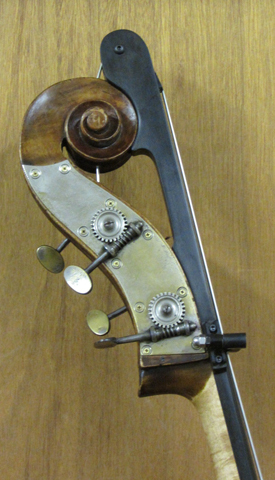 The Handmade Scroll is quite typical for the period of Basses made on the German/Czech border. These old German Gears probably replaced the original Hat Peg Gears and work quite well here. Copyright © 1998-2017 Ken Smith Basses, LTD.